534 COLOURlovers viewed this page and think ghake is a legend. I think I "luv"ed this once before but it deserves an encore! This showed on my notifications, but I do agree, Ghake does wonderful work. 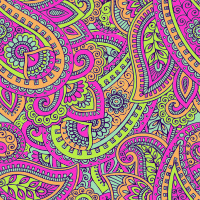 Paisley Meadow Pink, the color palette, captures the true nature of Paisley, or at least as I remember the colorful patterns that were used when paisley was really popular in clothes fashions, men's shirts, women's blouses, vests, scarfs, etc., Years ago, before you were born I'm sure!